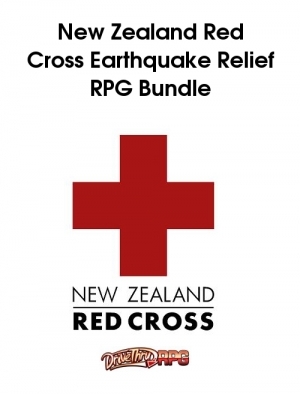 All proceeds to earthquake relief in Christchurch. Helping get this up and running has been a significant preoccupation in the last couple days. I’ve written before about similar efforts to help Pakistan & Haiti. The Christchurch quake isn’t on the massive scale of those disasters, but it has hit our small country pretty damn hard. If you’re into tabletop games, drop US$20 on this bundle. You will be rewarded with some incredibly cool bits of gaming genius, and you’ll be directly donating to a good cause. Everybody wins. Thanks to all those who purchase, all those who contributed products, and all those who helped make it happen. Posted by morgue on Thursday, February 24, 2011, at 9:17 am. Filed under And also. Tagged activism, earthquake, role-playing games. Follow any responses to this post with its comments RSS feed. Both comments and trackbacks are currently closed. !! That doesn’t sound good! I haven’t had any troubles with them, nor have others I’ve spoken to. Perhaps you could email RPGNow’s service people and see if they can help? It might be a known error. Or wait until you get access to a different computer and download them then – they’ll wait! Thanks for your support anyway. I hope you do get your hands on the games, they’re bloody good.